Irish genealogy databases: The top 5 subscription or pay-per-view sites. My selection of the best commercial sites for researching family history in Ireland. Major Irish genealogy databases were relatively slow to develop. 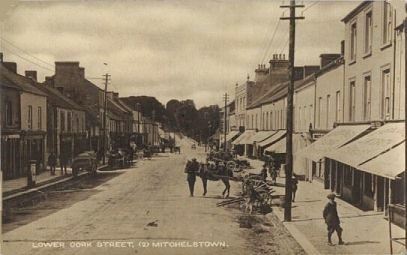 While monster one-stop shops became available to family historians researching ancestry in the UK or USA, Ireland's online offers remained stayed small and, for the most part, uncommercial. This started to change in 2009 and, from a slow start, Ireland's pool of online family history resources has grown dramatically, even if there are still many 'black holes'. On the positive side, many of the essential record collections are available free. There remains, however, no single one-stop shop solution to finding the best Irish genealogy databases, free or otherwise. It remains the case that Ireland's family history records are as scattered in cyberspace as they are on the ground. I think it's fair to say that while the majority of church records remain the preserve of just one commercial database provider (RootsIreland, see below) there will remain no single 'monster' site for Irish records. For the present, here's my selection of the top five subscription or pay-per-view Irish genealogy databases.They are listed in alphabetical order. There can't be many family historians unaware of this giant beast! While, Ancestry's collection of Irish genealogy databases is small compared with its offering for US and British resources, it has grown enormously quickly – especially since it added the Civil Registration Indexes (1845/1864 to 1921 in Northern Ireland and to 1958 in the Republic), a good sized collection of Roman Catholic parish records, plus an index to the NLI's Roman Catholic Registers Collection. See the relevant pages of this site for more information. The Irish materials are held in Ancestry's Ireland & UK collection. Among the 80-odd Irish record sets are the records of Irish immigrant arrivals in New York ports 1846-1851, Tithe applotment books (free elsewhere), Irish flax growers, Convicts transported to Australia 1788-1868, Royal Constabulary lists and Griffith's Valuation. 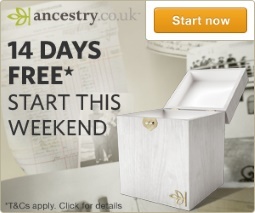 Ancestry has a number of monthly and annual subscriptions available. If you're not sure whether this is the best subsciption for you, take a free 14-day trial or select the 14-day pay-per-view option before deciding. In its huge database, the online British Newspaper Archive (BNA) holds around 700 newspaper titles. 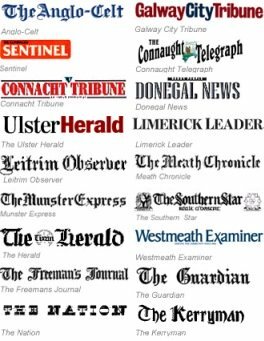 Of these, more than 160 are Irish publications, as at January 2019, and more are being added on a regular basis. While the earliest titles dating back to the 1700s, the majority of the online archive dates from the mid-19th century, and several continue into the 20th. Subscriptions are available on a monthly, three-monthly or annual basis for access to the entire holding. 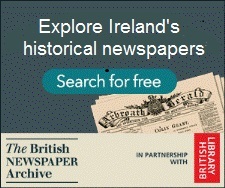 The online BNA is the sister site of FindMyPast (FMP) and its Irish newspapers database is automatically included in its Pro and Ultimate subscriptions. See below. Dublin-based FindMyPast Ireland was launched in May 2011 and was a big step forward for Irish genealogy. After a slowish start, its collection has grown considerably. The piece de resistence of the launch offer was the inclusion of the Landed Estates Court Rentals, which had never been online before. This collection can be an extremely useful resource, probably better appreciated by the more advanced genealogist than the beginner. Since its early days, FindMyPast Ireland has unveiled a string of collections including the Petty Sessions Books and Irish prison registers, plus a totally free index of the NLI's Roman Catholic Register collection (you need only to register, here, to view this free index). Another giant on the site is its collection of Irish newspapers. These are 'shared' on the site by FindMyPast's sister company British Newspaper Archives (see above). Since its early days, FindMyPast Ireland has unveiled a string of collections including the Petty Sessions Books and Irish prison registers, plus a totally free index of the NLI's Roman Catholic Register collection (you need only to register, here, to view this free index). Another giant on the site is its collection of Irish newspapers. These are 'shared' on the site, at no additional charge, by FindMyPast's sister company British Newspaper Archives(see above). 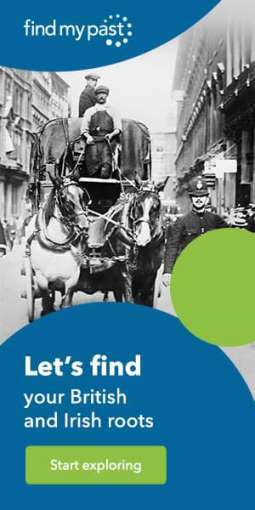 FindMyPast Ireland also has a good number of directories and many other useful resources, some of them of a niche nature. During 2018, the owners of FindMyPast (FMP) appear to have decided to put on hold or abandon their global ambitions and concentrate on the database's undoubted superiority in the provision of British and Irish records. As a consequence, subscription packages have been redesigned across the company's four sites (FindMyPast UK, FindMyPast Ireland, FindMyPast USA and FindMyPast Australia/NZ). Starter (available via FMP.ie, FMP.co.uk and FMP.com.au only): I don't generally recommend this package for Irish family history because the census, birth, marriage and death records included are available online elsewhere free of charge. Plus (available via FMP.ie, FMP.co.uk and FMP.com.au only): In addition to the Starter package records, this subscription includes Irish and British parish, military, crime and travel records, some of them exclusive, plus access to the 1939 Register for England & Wales. Pro (available via FMP.ie, FMP.co.uk and FMP.com.au only): This package includes access to the entire FindMyPast collection, which includes its entire historical British and Irish newspaper database and all records from North America, Australia and New Zealand, Britain and Ireland. Essential British & Irish (available via FMP.com only): Census, birth, marriage and death records from the UK, Ireland and US are included. So, too, are migration and parish records from Ireland and the UK. Ultimate British & Irish (available via FMP.com only): In addition to the Essential package above, this subscription provides access to British military records as well as British and Ireland institutional and wills/probate records. The British and Irish historical package is included, too. Be sure to compare each package carefully to get the best subscription for your research needs. This site features a database of over 9 million newspaper pages from more than 75 publications that date back as far as 1738. Every county of the island of Ireland is represented by at least one newspaper on the site. In addition to local titles, the database also holds a collection of major Irish 'nationals', including the Belfast Newsletter and Freeman's Journal. It also holds editions of the Irish Examiner (previously known as the Cork Examiner) from 1849 to 1949. As an archive of old news titles, this site is rather different to most other Irish genealogy databases. It puts our ancestors' lives into a social and political context and gives us the rich detail of historical events they lived through. With birth and marriage records, local news matters, obituaries from the Famine of 1847-1849, reports of the Irish Rebellion of 1798 or the Easter Rising of 1916, it's quite reasonable to expect that some events in your ancestors' lives may have been captured. Find out how to get the best from historical Irish newspapers. At November 2017 subscriptions to Irish Newspaper Archives cost €£$29 for one month and €£$149 for one year. The site frequently offers discounts, which are usually featured on Toolkit's Irish Genealogy Special Offers page. From the Irish Family History Foundation, RootsIreland.ie contains the largest online collection of Irish parish register transcriptions including those from Baptist, Roman Catholic, Church of Ireland, Methodist and Presbyterian and many other smaller faith groups. The site itself does not hold images of any register entries. However, transcriptions of most Roman Catholic entries (those dating up to 1880) are linked to the respective register on the National Library of Ireland's website of unindexed images. In this way, RootsIreland can be used as an index to the RC registers for most counties. For most counties, the RC records extend beyond those of the NLI's collection ie they continue past 1880, sometimes by a two, three or four decades. RootsIreland holds records for all the counties/areas coloured green. 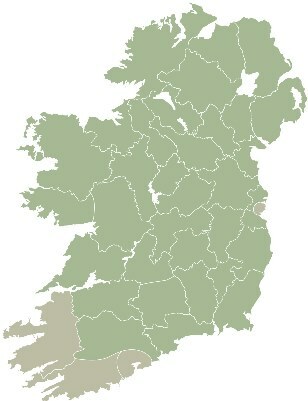 RootsIreland.ie holds records for all the counties/areas coloured green. It also holds transcripts from the civil records of birth, marriage and death for at least half of all the historical counties. These are not just index entries; they are transcriptions of the full bmd certificates. The database also holds census records. Some of these may be free elsewhere... see Irish Genealogy Toolkit's Census pages ... but some are exclusive. Taking the site as a whole, no records are held pre-1700 or after about 1920 but there are big differences between counties. To find out what is available in the locality you're interested in, check the 'Geographical Sources' list for each county. RootsIreland operates on a subscription model that includes a 24-hour option for those intending an intense genealogical workout! In addition, many of the site's old search restrictions have been removed, making it much easier to narrow down your searches. The fee-charging Irish genealogy databases listed above hold a selection of vital records covering the entire island of Ireland. If your ancestors came from Counties Antrim, Armagh, Down, Fermanagh, LondonDerry or Tyrone, be sure to also see my selection of the best websites for Northern Ireland genealogy research. It's so easy to make assumptions when carrying out genealogy research. It seems natural to believe that something stated as fact is, in fact, fact. But just because a gravestone says Gt Aunt Nellie was born in 1852 doesn't mean she really was born at that time. Just because you spell your surname one way doesn't mean it's always been spelt that way. Just because a man and a woman living in the same household claimed to be husband and wife on a census form doesn't mean they were legally married. Of course, it's perfectly possible that Gt Aunt Nellie really was born in 1852, and it's perfectly likely that all your ancestors were married when they said they were, but people have always told fibs and – even more frequently – people have made mistakes. Let's take good old Gt Aunt Nellie as an example. If she was born in the middle of the 19th century, she arrived on earth at a time when age and birthdays really didn't matter very much. She may have had only a hazy idea of when she was born. She may also, for the sake of vanity, have lopped a few years off her likely age when she married or completed a census declaration. When she eventually died, any surviving spouse or children may have had only a rough idea of her age and although they may have instructed the lettercutter to the best of their knowledge, the information supplied on her gravestone could well be wrong. If you assume the information to be correct, and rely on it in your research, you are leaving a false trail for others. Always make sure you can corroborate your research. Record your sources when completing family history forms and always, always, follow the documentary evidence.